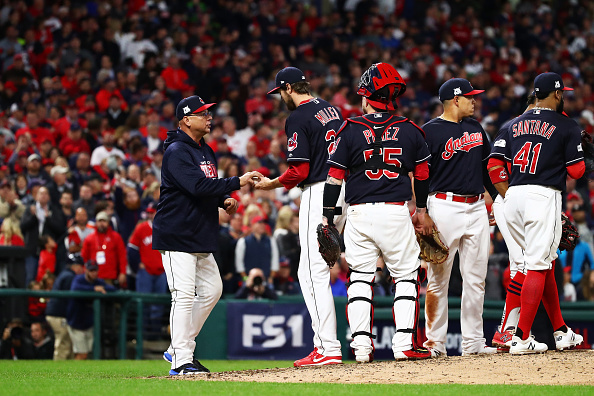 A couple weeks ago, I wrote a slightly doomsayer piece about how the Cleveland Indians’ lackluster offseason might cause the team’s window of contention to shrink. I’m not alone in these thoughts, as fans and media members remain unimpressed with the team’s attempt to strike while the iron is hot. However, it appears the Indians are hearing all this doubt, as numerous players have spoken out in response to it. Some are a little angry, others are saying things along the lines of “just you wait and see.” The consensus is the Indians are surprised to hear people question their chances, and are eager to prove naysayers wrong. By that, I don’t mean “oh gee it’s so great to hear players scoff at the concept of doubt.” I wouldn’t expect anyone in the clubhouse to respond to skepticism by pointing out how correct it is to worry. That said, players going out of their way to respond to skepticism implies it’s been loud enough for them to hear. As a result, I encourage everyone to keep loudly doubting the Indians’ chances. They very badly need to get back to playing with a chip on their shoulder. Make no mistake, last year’s epic postseason choke was due in part to the team getting caught up in its own headlines. The players took to 2017 the same way the fans did – riding high on being this close to winning a World Series the year before and assuming the signing of slugger Edwin Encarnacion was all Cleveland needed to complete the job. The Tribe was a popular pick to win it all, and carried itself like a team which couldn’t be bothered to care until October. The result was a sluggish start to the season which lingered until mid-August. From there, a historic 22-game winning streak accomplished two things. It got the team playing to the best of its abilities, but also led to players getting cocky again. The ship was righted, so let’s just fast-forward to the World Series parade. The Indians eventually learned the hard way you don’t win anything on paper. Cleveland clinched home field advantage in the American League, only to blow a 2-0 lead in the ALDS. The sudden end to the season, followed by an offseason full of nothing but players departing, has led some to wonder if the incredible ride in 2016 was a blip on the radar as opposed to a sign of things to come. Again, though, if there’s any positive to how last season ended and how quiet the winter has been, it’s that players are sounding off on anyone who doubts them. If this sounds familiar, it’s because it’s exactly what happened two seasons ago. Remember, an astounding amount of doubt was heaped on the 2016 Indians with just a month left in the regular season. Despite being on top of the AL Central standings, the team had just lost starting pitcher Carlos Carrasco for the year with a broken finger. Local beat writer Paul Hoynes famously wrote the Indians’ obituary the next day, essentially claiming there was no point in watching them anymore. Instead of rolling over, players used Hoynes’ column as fuel, rallied through the playoffs with essentially two and a half starting pitchers and came within one run of winning it all. Now, I’m not saying a few naysayers guarantee Cleveland a championship. The team still has some holes to figure out, and will certainly feel the effect of the losses its dealt with this offseason. Still, the differences between the 2016 and 2017 Tribe teams are incredibly glaring. One used doubt as motivation to overcome any shortcomings on the way to almost winning a championship. The other fell in love with its preseason praise and fell woefully short of expectations. Simply put, this group plays far better when its motivated. Over the past two years, the Indians played their best ball when people began doubting their chances to succeed. The World Series run was sparked by a local writer telling the team there was no point in playing anymore. When people spent last summer wondering if the Indians would ever shake out of their funk, they responded by winning their next 22 games. So, yeah, keep doubting the Tribe. If you’re worried about the team’s chances to win this year, let your voice be heard. The Indians are apparently listening and, if they respond to it the same way they did two years ago, it could lead to one hell of a season.